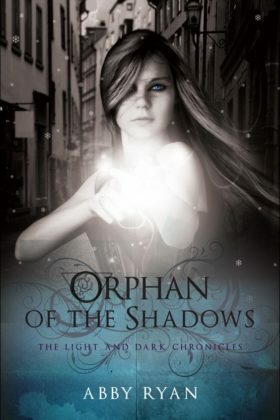 In the faraway kingdom of Madaren, Elon Amaeloriey, a young orphan girl, lived a life of pain and struggle. But the lonely life she knew changed forever the day she stumbled upon a gang unlike any other. Urban fantasy for young adults and older by Abby Ryan. In the faraway kingdom of Madaren, Elon Amaeloriey, a young orphan girl, lived a life of pain and struggle from the day her parents passed away. But the lonely life she knew changed forever the day she stumbled upon a gang unlike any other. Elon learns to fight alongside the Dragon gang while they strive to keep their territory free of their rivals and of the Niesin–Bratched’s demons. No longer an Orphan of the Shadows, Elon’s life seems to be brightening until she learns of the Darkness looming over her. The Dark side believes the King has chosen Elon for a place of authority in the realm, and they will do anything to capture her. The Dark princes of Jasikx, Tarrek and Albree Vaydmehn, are desperately trying to find her. The Light prince, Zedikajah (Kaj), is also frantically searching for her too, in order to keep her safe from Darkness. But his efforts are failing. When the safety of a realm relies on the safety of one girl, will one boy succeed?